Pot roast is comfort food. And it is SO easy if you have a crock pot or a cast iron Dutch oven. This is also a cheap meal- you do not need expensive cuts of meat here. I always look for the cheapest hunk of lean beef I can find, and if it is on clearance- then even better! Bone in or bone out- it doesn't matter. Throw in some onion and carrot, and this is almost a meal by itself! Add a salad on the side, or green beans like I do. The number of servings depends on how big your roast is. You allow 4oz or 6oz of meat (depending on weight loss goals) per person. The rest are freebies, so load up. You can start this in the morning before work and come home to a hot delicious dinner, almost complete! EASY PEASY! If you have roast left over, you can make soup! Especially if you have a lot of broth from the meat. 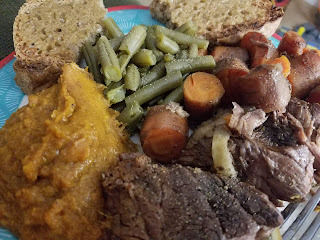 Simply shred the leftover meat, add diced carrot, celery, onion, a sprig of fresh thyme, some green beans, diced sweet potato and simmer on low until veggies are done. Add more beef stock, if you need the liquid. So easy and tasty and a good way to get 2 meals out of one pot. Brown your hunk of beef in the cast iron Dutch oven or a skillet if you are using a crock pot. Get a good sear on as many sides as possible. You want lots of color, so do this on high heat. If the meat sticks when you go to turn it, it is not ready- let it sit for a couple minutes more. It will release when the crust is formed. If you are using a crock pot, put the hunk into the crock pot. Lay onions on top of the meat. Throw carrots and garlic and bay leaf in. Pour splash of stock or water in. Cover and cook on low (or 300 degree oven for Dutch oven) for 8-10 hours, or high (375 degree oven) for 6-8. Meat should fall apart when done. Bake these ahead of time if you need to. Bake them in the skin. Keep in fridge until needed. Peel the potatoes and discard peel. Mash them with a fork. Add spices and stir to mix. Taste and adjust seasoning.